Chemist, engineer, innovator, armaments manufacturer and the inventor of dynamite. 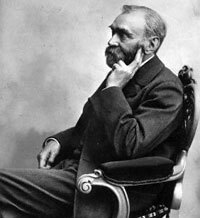 Alfred Bernhard Nobel (October 21, 1833 - December 10, 1896) was a Swedish chemist, engineer, innovator, armaments manufacturer, and the inventor of dynamite. He owned Bofors, a major armaments manufacturer, which he had redirected from its previous role as an iron and steel mill. In his last will, he used his enormous fortune to institute the Nobel Prizes. The synthetic element nobelium was named after him. Nobel was born in Stockholm, Sweden on October 21, 1833. His parents were Immanuel Nobel, an engineer, industrialist, and inventor, and Caroline Andrietta Ahlsell. By the time of his birth, his family already figured prominently in scientific circles. He was a direct descendant of Olof Rudbeck, a medical pioneer who investigated the lymphatic system. As an engineer in the business of constructing railroads and bridges, Nobel's father searched for ways to blast rock more efficiently. His construction business in Russia, however, failed the same year Nobel was born. He was forced to declare bankruptcy and moved his family to Stockholm. Four years later, Immanuel left for St. Petersburg, where he opened a factory to supply the Russian military. He later developed and manufactured naval mines that successfully protected the port from invasion by the British navy during the Crimean War. Nobel's formal schooling began at St. Jakob's Higher Apologist School in Stockholm, but lasted only a year. In 1842, his family moved to St. Petersburg, to join Nobel’s father. There, Nobel was educated by tutors and became fluent in many languages while mastering the principles of chemistry and physics. In 1850, Nobel was sent to Paris to further his education in chemical engineering. There he studied under the famous chemist, Théophile-Jules Pelouze at the University of Torino, where he also met Pelouze’s assistant, Ascanio Sobrero, the Italian chemist who invented nitroglycerin. Nitroglycerin was many times more powerful than gunpowder, but in pure form was so volatile that it could not be safely used as a blasting material. The Nobel family’s interest in explosives must have focused the young Nobel’s interest in Sobrero’s invention, the improvements to which would make Nobel wealthy later in life. After a year of travel in Europe, Nobel studied in the United States with John Ericsson, the marine architect who built the famous iron-clad naval vessel, the Monitor. Nobel returned to St. Petersburg in 1852 to help his father in the family factory, which during the Crimean War (1853-1856) produced munitions for the Russian side. After the war, Immanuel Nobel had trouble adjusting to peacetime production, and his firm was forced into bankruptcy in 1859, compelling his family to return to Sweden. Two Nobel brothers reorganized the firm and entered the oil industry, in which the firm prospered. Nobel and his father developed a practical method of manufacturing nitroglycerin on a large scale in 1862. The following year, Alfred created a blasting cap that could set off nitroglycerin more safely. Father and son established a factory, Nitroglycerin Ltd., in Heleneborg, Sweden, to capitalize on their new innovations, and Alfred Nobel assumed many of the operational functions of the company. Several explosions, however, including one in 1864 that killed his brother Emil and several workers, convinced Nobel that a method to make nitroglycerin safer had to be developed. In 1867, Nobel invented dynamite, a mixture of nitroglycerin and minerals that was stable enough to be handled without the risk of premature or accidental detonation. In 1875, Nobel developed blasting gelatin, an even more versatile and powerful explosive. In 1887, he invented a smokeless blasting powder called Ballistite, made from nitroglycerin, nitrocellulose, and camphor. These inventions revolutionized the construction industry by reducing costs involved in blasting rock to make way for highways, railroads, and bridges. They also contributed to the destructive force of military weaponry. Nobel's contributions to science were not confined to munitions or explosives. His work led to the manufacture of artificial silk, rubber, and semiprecious stones. He also completed research in the areas of optics, electrochemistry, and biology. Nobel was intensely interested in science and invention, and ran a network of factories throughout the world to produce his products. He was constantly on the move. He never married, although later in life, there are indications he felt the importance of family life. In his 40s, he took on a secretary, Countess Bertha Kinsky, but the relationship did not result in marriage, and Kinsky soon married Count Arthur von Suttner of Austria. Through their continued friendship, the countess, who was a professed pacifist, is often credited with pressing Nobel to pay more attention to using his resources to promote world peace. His inventions and innovations, reflected in the more than 350 patents he was awarded in his lifetime, brought Nobel great wealth, but criticism of his devotion to armaments in the press made him turn inward later in life. He altered his will to provide for prizes that would be awarded to those who profoundly added to the progress of mankind in the realms of science, literature, and peace. The Nobel prizes are administered by the Royal Swedish Academy of Science (physics and chemistry), the Royal Caroline Medical Institute (medicine, physiology), the Swedish Academy (literature), and the Norwegian Parliament (peace). The prize winners are announced annually, and provided with a generous monetary award. Nobel had a literary side, and produced poetry and dramatic works, although the evidence is that they were not particularly well received. A desire to change his legacy from an armaments manufacturer to a man of peace is said to have been spurred by an obituary that appeared in the late 1880s in the Paris newspapers and that, mistakenly, wrote of his own death, using the headline, "The merchant of death is dead." This event is said to have jolted him into paying more attention to the way history would view his life, resulting in his idea to create the annual prizes that are named after him. In 1893 he bought AB Bofors in Sweden, and transformed it from an iron works into an arms manufacturer. On November 27, 1895, at the Swedish-Norwegian Club in Paris, Nobel signed his last will and testament and set aside the bulk of his estate to establish the Nobel Prizes, to be awarded annually without distinction of nationality. He left 31 million kronor (about $4 million in 1896 but closer to $100 million in today’s dollars) to fund the prizes. While staying at his villa in San Remo, Italy, Nobel suffered a cerebral hemorrhage. He died on December 10, 1896. Abbot, D. A., ed. 1994. The Biographical Dictionary of Scientists. New York: Oxford University Press. Gillispie, C. C. 1971. Dictionary of Scientific Biography. New York: Charles Scribner's Sons. Schück, H., and R. Sohlman. 1929. The Life of Alfred Nobel. London: William Heineman Ltd. Von Meyer, E. 1906. A History of Chemistry. London: MacMillan and Co.
Alfred Nobel - Man behind the Prizes. This page was last modified on 2 March 2019, at 23:59.